Ospreys were the "architects of their own downfall" in their European Champions Cup defeat at Bordeaux-Begles, says captain Alun Wyn Jones. The Welsh side were beaten 33-27 but claimed two losing bonus points, as they did in November's defeat by Clermont Auvergne. Ospreys remain top of Pool 2, but Wales second row Jones was frustrated with the result. "It [two points] is still probably not enough if we're honest," said Jones. "We were the architects of our own downfall in the first half and in the grand scheme of the game really. "After we went behind we had to chase and that cost us at the end of the first half but then probably rewarded us in the early stages of the second half." Jones, 30, scored Ospreys' third try as they fought back from 30-15 down to cut Bordeaux's lead to 30-27. The visitors played an attacking and loose style of rugby throughout, which proved productive and costly in equal measure. 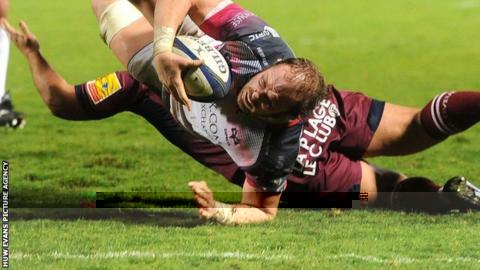 Although they scored four tries to secure a bonus point, wayward Ospreys passes also led to two of Bordeaux's four scores. "You're damned if you do, damned if you don't," said Jones. "It's finding a happy medium. At times we were over-exuberant in the first half and a bit naive in the second. "We're not going to blame the powers that be but we feel a little bit hard done by, particularly with the number of times we visited their 22. "But then again we were the architects of our own downfall when we did do that." Ospreys are two points clear at the top of Pool 2, with second-placed Exeter away at Clermont Auvergne on Sunday. On his side's chances of reaching the quarter-finals, Jones added: "It's wide open really, so it should be good."